CHALDEAN NUMEROLOGY: THE ORIGINAL NUMEROLOGY SYSTEM: Reappearing symbols -- what do they mean? Okay, so here's another thing I have experienced along my road...or path, if you like. It is rather interesting and I can't help but wonder if others have experienced similar oddities. A few days ago, I began noticing the recurrence of a pattern that I have seen before. This pattern always leads to major life changes of one kind or another and involves the symbols which surround us every day. For you, it could manifest as noticing a particular sign, number, letter, word, shape, animal: anything which strikes you as out of the ordinary due to its repetitiveness and the (usually) short period of time during which it occurs. I call this symbology: the awareness of what is around us and using all of our senses in more advanced ways...for example, let's you are sitting in front of the telly and absentmindedly thinking about your visit to the dentist the next day. You hate dentists. Well, not dentists, exactly: rather, their big drills and poky instruments. Anyway, you are just thinking 'I hope it is easy and painless' and at that precise moment, a voice on the TV echoes those exact words: 'easy and painless'. Not only is this not a coincidence, it is a perfect example of parallel energies which serve to either reassure or warn us, depending on the circumstances or situations. This is what occurs when we 'tune into' the material and sensory world that surrounds us every day and is filled with a variety of forms of synchronicity and symbology. In the above example, if you are aware of symbology, you will smile and be immediately reassured that your visit with the dentist will indeed be easy and painless. Symbology involves using all of our senses to become hyper-aware of what is happening around us and how objects and activities can and do relate to our own lives. This observation can take the form of numbers, shapes, particular animals or symbols, words...anything that sticks in your mind or strikes you as out of the ordinary based on the number of times it is seen or when it is heard (which is simply another category of symbology). 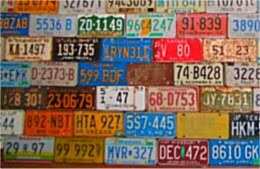 Over the years, there have been several separate and distinct occasions (usually lasting a few weeks) when it seemed like almost every other car I saw had a license plate bearing my initials. Some might say, yeah, so what? Well, give it a try. See how many times you see a car with your complete set of initials on it, or even your date of birth. Not often, this I can almost promise you (I say 'promise' because you might be another one who experiences the same thing I do). In the past, these strange occurrences were always followed by a major shift in my life. Something big would happen: I would move suddenly, find or change my job, meet someone who would prove to change my life, lose someone I cared for through death or a distant move...the point is that their appearances always preceded a rather major shift in the direction of my life. And I have started seeing them again. I wonder what's coming this time? It is exciting to me as I know it is one of the ways Universe communicates to and with me...and that 'something' is coming...it's almost like Christmas. It's the thrill of not knowing what's in the box, when it will arrive, what it will contain and how it will affect my lifepath. And whether or not I will like it.